I recently posted about the paper counter stands I got for my birthday but never used them in actual play. In another session I play in, I finally got to test them on the gaming table. None of the paper counters were customized for this game because only the DM knew what we were about to fight and he still hadn't seen them. When I busted them out, there wasn't much a fuss, and I thought, well, they're cool, we just need to use them in context. 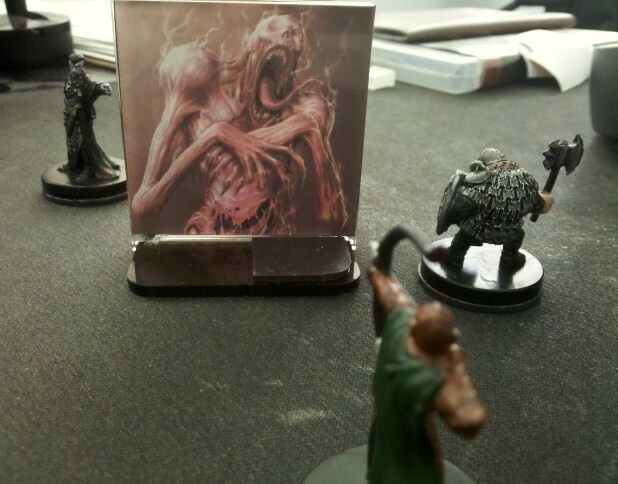 When the DM described a giant pile of body parts stepping out from the wall in our undead dungeon and a Huge chain golem appeared on the table as a proxy, another of the players ooohed and aaahed over how cool it looked, I wondered, can minis be topped, even as proxies? But then one of my paper counter guys happened to fit the description of a monster we were about to fight, and he was set on the table. He looked a bit out of place with the other miniatures, but people were really drawn to him because he best matched what the player was describing. When someone killed him, a miniature (still alive) was taken off the table and replaced with the paper counter because it looked like what we were fighting. He was the preferred option, and in a way, I was surprised by how much the paper counter stands added to the atmosphere of the game.